November 15, 2018 17:00 ET | Source: Balmoral Resources Ltd.
VANCOUVER, British Columbia, Nov. 15, 2018 (GLOBE NEWSWIRE) -- Balmoral Resources Ltd. (“Balmoral” or the “Company”) (TSX: BAR; OTCQX: BALMF) provided an update on the fall 2018 exploration program on its Detour Gold Trend Project in Quebec, along with updates on activities on its other exploration properties in Ontario and Quebec, Canada. Drilling continues with two drills still active on Balmoral’s Grasset and Fenelon properties in Quebec targeting nickel-copper-cobalt-platinum-palladium mineralization within the Grasset Ultramafic Complex (“GUC”). One drill is actively working to expand the Grasset nickel-copper-cobalt-PGE deposit, which currently features an open-ended Indicated Mineral Resource estimate of 3.45 Mt @ 1.56% nickel, 0.17% copper, 0.03% cobalt, 0.34 g/t platinum and 0.84 g/t palladium (see NR16-04; Mar 7, 2016). The Grasset deposit has been delineated to a vertical depth of just over 500 metres (see Figure 1), below which it remains open for expansion. Approximately 2,500 metres of drilling has been completed to date as part of the 2018 resource expansion program at Grasset. This includes a > 1,000 metre long ‘pilot’ hole whose primary purpose is to serve as a platform for the evaluation of the Grasset deposit at vertical depths of 500 to 750 metres via a series of wedge cuts. 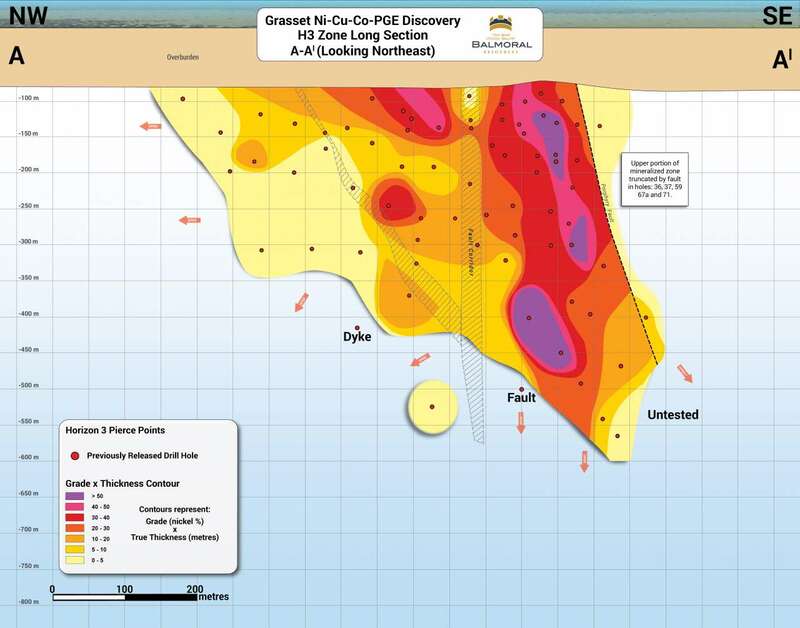 Six to seven kilometres northwest of the Grasset deposit Balmoral has completed five holes, totaling 2,900 metres, testing a series of targets within both intrusive and extrusive phases of the GUC. Initial borehole electromagnetic (“BHEM”) work on a number of these holes has successfully outlined EM conductors directly - or interpreted to be - associated with recently discovered zones of sulphide mineralization. These anomalies are high priority targets for follow-up drill testing. Initial analytical results from the GUC drill program are anticipated within the next three to four weeks. The current drill program will continue into late November before taking a hiatus to allow for completion of logging in the area being explored. The planned logging activities will increase the Company’s access for follow-up drilling. On the Detour East property Balmoral announced that it has identified the extension of the Vortex Gold Zone discovered by the Midland Exploration Inc./Soquem Inc. joint venture on the adjacent Casault property. A single drill hole collared approximately 195 metres west of the eastern boundary of the Detour East property (see Figure 2) has successfully intersected the Vortex Gold Zone Extension, returning a downhole intercept grading 1.60 g/t gold over 7.00 metres (from 352 to 359 metres down hole) including, 4.01 g/t gold over 0.69 metres. With the confirmation of the Vortex Extension onto the Detour East property, gold mineralization has now been traced for 1,600 metres across the two properties and remains open to depth and to the west on ground controlled by Balmoral. The Vortex Gold Zone occurs along the sheared contact between interpreted tholeiitic and calc-alkaline volcanic sequences, immediately south of a distinct magnetic horizon which can be traced west across the Company’s holdings for at least 3,500 metres. This extensive new zone of gold mineralization occurs within the same regional scale deformation corridor that hosts the nearby Detour Lake Gold Mine. The airborne magnetic-electromagnetic (“AEM”) survey of the RUM nickel properties in Quebec has commenced. The survey has progressed slowly due to very poor weather conditions in the region which appear set to continue in the near term. To date approximately 8% of the planned survey has been completed and the Company has not received any results. The AEM survey of the recently acquired Gargoyle and Goblin nickel properties in Ontario is due to commence on or about November 12, 2018. The commencement of this survey is also contingent on weather conditions. Balmoral has been advised by the operator of the Northshore property joint venture, GTA Resources and Mining Ltd. (GTA:TSXV) that a 1,000+ metre diamond drill program is set to commence on the Northshore property located near Schreiber, Ontario. The first two holes proposed are designed to evaluate the Afric Gold deposit on the property at or below the 350 metre vertical level, which will represent the deepest tests of the deposit to date. Given the limited scope of the drill program, and minor dilution to its current 46% joint venture interest which will result, Balmoral has chosen not to contribute to this program. Results from the program are anticipated in early 2019. The previously disclosed geophysical program on the Hwy 810 property (see NR18-11, August 30, 2018) has been completed. Induced polarization anomalies were identified on all five grids surveyed, several of which correlate with airborne EM anomalies and/or interpreted structural corridors on the property. The surveyed areas, which contain either gold or base metal targets, are now drill ready. The Company may proceed with initial drill testing of the Hwy 810 property in 2019, or look to find a partner to aid in the advancement of this large property, which is strategically located between the producing Casa Berardi gold mine and the former producing Selbaie zinc-copper-gold silver mine in Quebec. The sale of the 1% NSR royalty held by the Company on the Fenelon Mine Property in Quebec, announced on October 10, 2018 (see NR18-15; Oct. 10, 2018), has been completed. The Company received a cash payment of $500,000 as well as 1,000,000 common shares of Ely Gold Royalties Inc. and common share purchase warrants which the Company may, at its discretion, exercise over a period of 18 months from November 2, 2018 to acquire up to an additional 1,000,000 common shares of Ely Gold Royalties Inc. at a price of $0.10 per share. Mr. Michael Tucker (P. Geo. B.C., Ont. and Restricted Permit, Que. ), Project Geologist for the Company, is the non-independent qualified person for the technical disclosure concerning the Grasset and Fenelon properties in this release. Mr. Tucker is currently supervising the fall 2018 drill program on those properties and has worked on the Grasset and Fenelon properties since 2014. Mr. Darin Wagner (P.Geo. B.C., Ont. and Restricted Permit, Que. ), President and CEO of the Company, is the non-independent qualified person for the balance of the technical disclosure contained in this news release. Mr. Wagner has supervised the Company’s exploration activities since inception. Both individuals have reviewed the technical content of this release. This press release contains forward-looking statements and forward-looking information (collectively, “forward looking statements”) within the meaning of applicable Canadian and United States securities laws. All statements, other than statements of historical fact, included herein, including statements regarding the anticipated length of the current drilling program, the utility and usefulness of certain geophysical surveys, the correlation of geophysical anomalies to mineralization of interest to the Company, the assay results from sulphide or other mineralization intersected in on-going drilling and anticipated results and timing of the Company’s exploration programs in general are forward-looking statements. Forward-looking statements are typically identified by words such as: believes, expects, anticipates, intends, estimate, postulate and similar expressions or are those which, by their nature, refer to future events. Although the Company believes that such statements are reasonable, there can be no assurance that such statements will prove to be accurate, and actual results and future events could differ materially from those anticipated in such statements. The Company cautions investors that any forward-looking statements by the Company are not guarantees of future performance, and that actual results may differ materially from those in forward-looking statements. Important factors that could cause actual events and results to differ materially from the Company’s expectations include those related to the mineral tenor of mineralization intersected on the properties, the success or failure of the geophysical contractors to survey individual drill holes and interpret the results from the surveys, factors relating to weather, staffing and costs which may be beyond the control of the Company, metal prices and economic considerations related to mining and exploration, access to financing to continue the Company’s exploration activities and the financial stability of the other companies mentioned and the market fluctuations in prices for securities of exploration and mining stage companies. Trading in the securities of the Company should be considered highly speculative. All of the Company’s public disclosure filings may be accessed via www.sedar.com and readers are urged to review these materials, including the latest technical reports filed with respect to the Company’s mineral properties.